As every pizza maker knows, pizza has a long history. And while the original Neapolitan pizza had a light and slightly crispy texture, chefs from all around the world have created their own take on this popular dish, each bringing something new and interesting to the table. 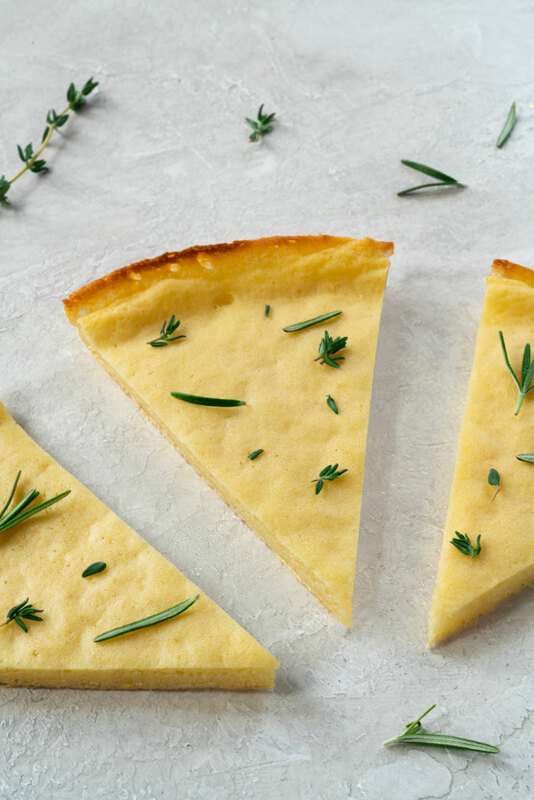 Whether it’s a Neapolitan-style thin crispy crust, Sicilian thick chewy crust, or a simple Focaccia flatbread, pizza has taken on many different forms since its original inception, especially when it comes to the crust. The crust has always been a main target for pizza innovation due to its ability to entirely change the dynamic of a pizza. 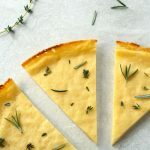 The beauty of this low carb pizza crust is that you can make it as thin or as thick, as crispy or as chewy as you like… you can even make a cracker out of the batter! Yes, batter – there is no kneading or rolling required. Am I selling you on this low carb pizza crust yet? I make pizza from scratch at least once or twice a week. If it was up to my kids (and my husband), we would have pizza every single night. I switch up the sauce and the toppings every now and then, but keep coming back to this crust no matter how many different pizza crust recipes I’ve tried. A few months ago, I posted a recipe for red lentil pizza, which you guys seemed to love. Since the recipe was so popular, I decided to experiment with other legumes. I purposely chose legumes that were light in color and neutral in flavor – chickpeas, red and yellow lentils, and yellow split peas. All of these legumes worked wonderfully, so you can probably use any legume you like. The most difficult part in experimenting with different legumes was figuring out the amount of water because every legume absorbs water differently. Red and yellow lentils need the least amount of water, while chickpeas require the most. Chickpeas are particularly tricky because some varieties double in size after soaking, some triple in size after soaking. The more the chickpeas re-hydrate during soaking, the less water they need for cooking. I have tried this recipe with and without baking powder and prefer the one with baking powder. The baking powder produces an initial set of gas bubbles when mixed with wet ingredients and then a second set when heated. The first reaction forms many small gas cells in the batter; the second reaction expands the bubbles to create a light texture. If you’re going for a thin and crispy crust, you can skip the baking powder. A little bit of salt, and you’re ready to bake your crust. Regardless of which legume you choose for this recipe, you’ll wanna soak it in cold water first. The smaller the legume, the less time it needs to adequately rehydrate. If you decide to not soak at all, you’ll need to increase the amount of water for cooking. I always blend all the ingredients in a Vitamix and then let the batter rest for a few hours before baking. The resting period is important if you want a thicker crust because the baking powder enlarges the bubbles which are already present in the batter produced through blending. The bubbles continue to expand as long as the batter is not fully baked. When the batter sets into a firm structure during baking, the aeration is preserved which you see as the tiny air holes throughout the pizza crust. When you’re ready to bake the pizza crust, crank the oven all the way up and let it preheat. If you have a pizza stone, use it here. I set the oven rack on the second highest position, and put my baking stone on it. The pizza stone helps push heat up into the bottom of the pizza crust, so that it crisps from below. With the oven fully preheated, cover the bottom of the pan with a little bit of olive oil. Then give the batter a good stir and pour it into the skillet. A successful pizza crust will have golden brown crispy edges with a slightly blistered surface and moist interior. This low carb pizza crust is crispy on the outside and tender, chewy on the inside. It's based on legumes, which happen to be the only ingredient required for this recipe. On top of being low carb, this pizza crust is also vegan, grain-free, and high in protein and fiber. Drain and rinse soaked lentils/split peas/chickpeas. Add them to the blender together with water, garlic, baking powder, and salt. Blend until smooth. If you want a thicker crust, let the batter rest for up to 4 hours. When you're ready to bake the crust, preheat the oven to 400°F (205°C). Place a 12" cast iron pan into the oven as the oven is preheating so the pan heats up as well. Remove the cast iron pan from the oven and add a little bit of olive oil to the pan. You want the bottom and the sides of the pan to be coated with oil so the crust doesn't stick. Give the batter one last stir and pour it into the hot pan. Tilt the pan so the batter coats the entire surface of the pan, if needed. Carefully put the pan back into the oven (onto a rack positioned in the middle of the oven). Bake the crust for about 30 minutes or until the edges pull away from the pan and turn golden brown. In the last minute of baking, turn the broiler on to slightly blister the surface. Remove the pan from the oven and let the crust cool slightly. Using a flat spatula, work your way under the pizza crust and ease it from the pan onto a cutting board. The pizza crust is best if used immediately after baking while still warm, but can be refrigerated for up to 1 week. *You can also use 1/2 cup dried split peas (with 1/2 cup water) or 1/3 cup dried chickpeas (with 3/4 cup water). It's fine to measure dried lentils and split peas. However, chickpeas are a bit trickier because sometimes they double, while other times they triple or even quadruple in size after soaking. So, if you are using dried chickpeas to make the crust, I would recommend soaking 1/3 cup dried chickpeas but then measuring the soaked chickpeas. For a 12-inch crust, I used 1 cup/150 g soaked chickpeas with 3/4 cup (180 ml) water. *Soak the lentils in cold water for at least 4 hours, ideally for 8-12 hours. Split peas and chickpeas need at least 8 hours. **For a thicker (chewier) crust, use up to 1 tsp./8 g baking powder. ***Prep time does not include soaking the legumes (4-12 hours). Could you please advise me, how much water I need for 1/2 cup of whole, round chickpeas? Dear Petra, thank you so much for your advice!!! I always have chickpeas in my home, so I’m happy that I can try to make pizza crust from it! This looks soooo good! In your above mention of usage of the pizza stone, do you mean that you actually pour the dough unto it or place the cast iron pan on it in the oven as an extra heat source? Thanks ! Hi Sheryl – a great question! I put the cast iron pan directly onto the pizza stone. Hey there! 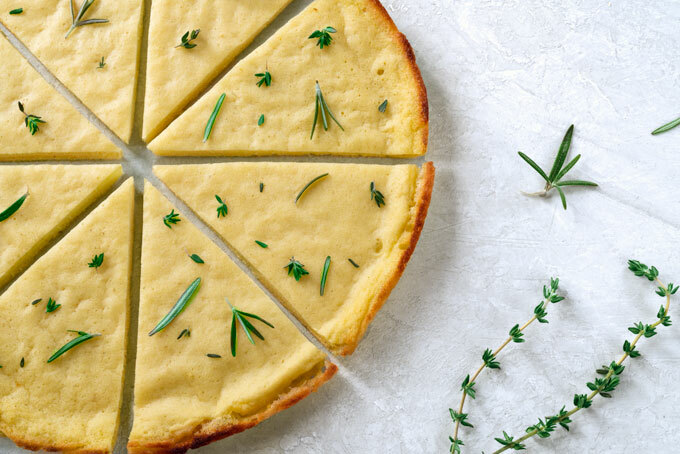 looks delicious and I really wanna give it a try, but I‘m from Switzerland and we don‘t have cast iron pans, so could I bake it in a normal baking dish or what would you recommend? Hi Linda – I know it does stick to stainless steel, so I would use that. I have never tried baking the pizza crust in say a ceramic dish. It might work. If you’re willing to experiment, I would definitely give it a try. If you wanna be absolutely certain the crust doesn’t stick, line your dish with a piece of parchment paper (not wax paper!). The crust won’t brown at the bottom if you use parchment, but it won’t stick. 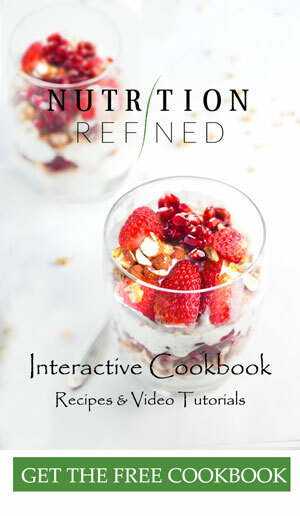 Hi Hoyt – to be honest, I always have some soaked (usually even sprouted) legumes on hand, so I have never even tried this recipe with canned (cooked) chickpeas. Worth a try if you’re willing to experiment although I am pretty sure you will need less water (since cooked chickpeas contain more moisture and are much more tender). If you have a Vitamix or a coffee grinder, I would just grind dried (unsoaked) chickpeas into flour, rehydrate the flour for a few minutes, and use that as the base. I have tried it in the past and it works beautifully. The ratio is 1 cup chickpea flour to 1 cup water. I just realized you mentioned you’re oil free. 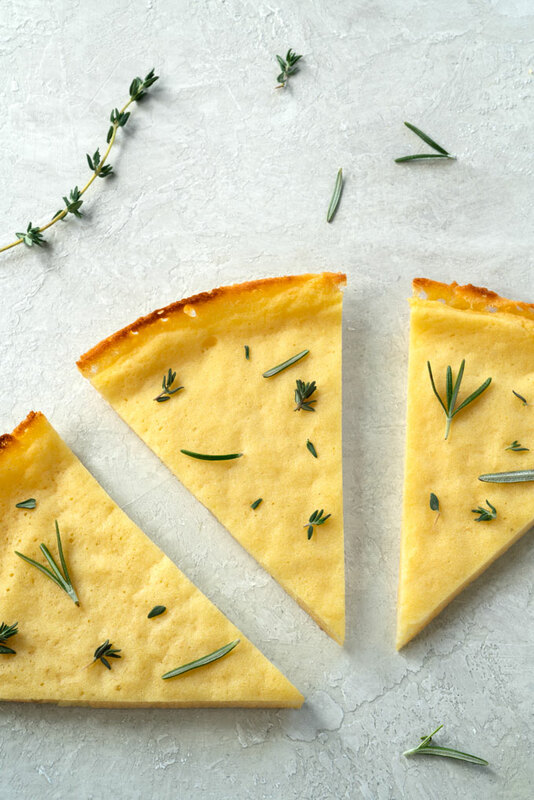 If you’re not using any oil, make sure you use some type of non-stick pan or a well-seasoned cast iron pan, so the crust doesn’t stick to the bottom of the pan. This sounds so great that I tried it right away. I used cooked chickpeas (pretty dry; previously frozen). The crust cracked all over into small pieces (perhaps 1″ across) rather than sticking together as a crust. It did pull away from the edge of the seasoned skillet. However, it was delicious. I think I need to try again with beans that have been soaked and not precooked. OK, good to know that following directions is really important. 🙂 Not my strongest suit. 😉 I think it sounds even better with lentils anyway. I will try that.